The Statistics section allows you to connect your own Google Analytics account to the ZP app and display the most important page data right within the app. 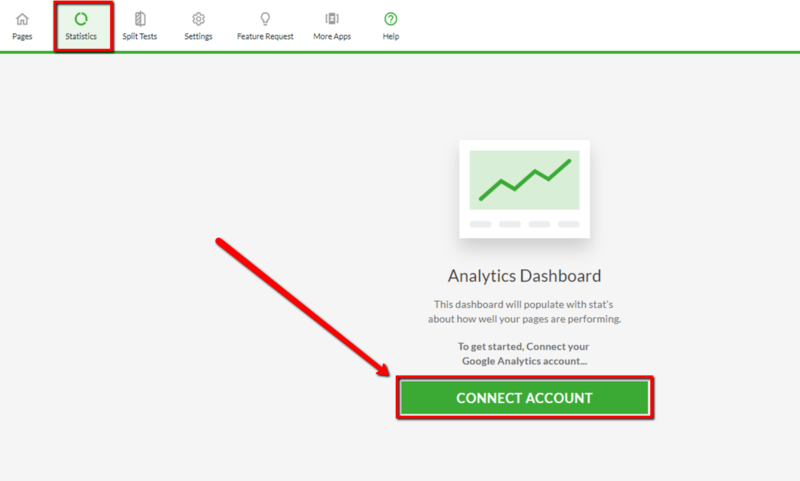 Your Google Analytics account can be connected either through Settings -> Integrations of the ZP app (Google Analytics subsection) or by clicking on the “Connect to Account” button when in the Statistics dashboard. Note: Zipify Pages collects no statistics in-app, but uses data from your own Google Analytics account and makes it available right within the Statistics section of the Zipify Pages app. The ZP Statistics dashboard replicates Google Analytics' behavior for your convenience. 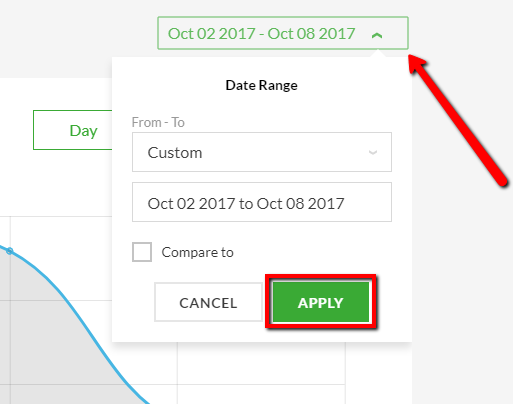 Use the date picker above the graph to select a reporting period from a pre-defined set of values or a custom date range. In order to build the graph you also need to select one of the available metrics. 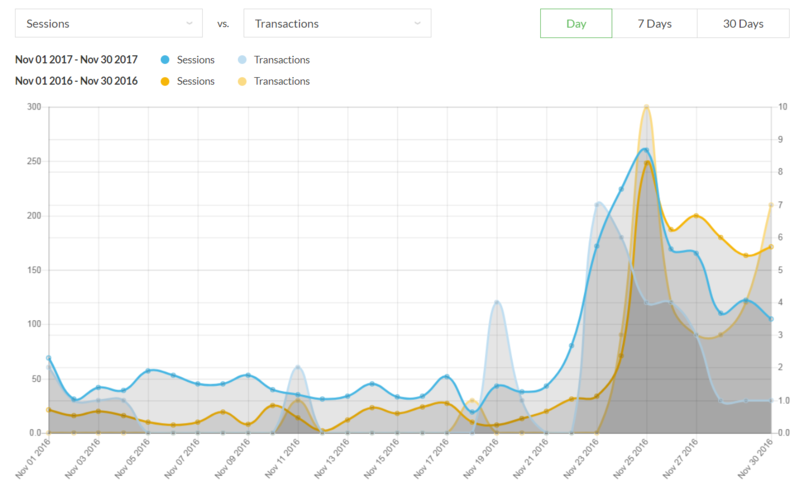 “Sessions” is the default metric, so the graph will be built based on sessions by default. Other metrics include: Transactions, Revenue, E-commerce Conversion Rate and Avg. Order Value. Use the second drop-down menu to build a graph for some other metric and compare it to the initial one. The left-hand-side's axis will show the data values for the first metric chosen (Sessions in this example) and the right-hand-side's axis will show the data values for the second metric chosen (Transactions in this exampl). 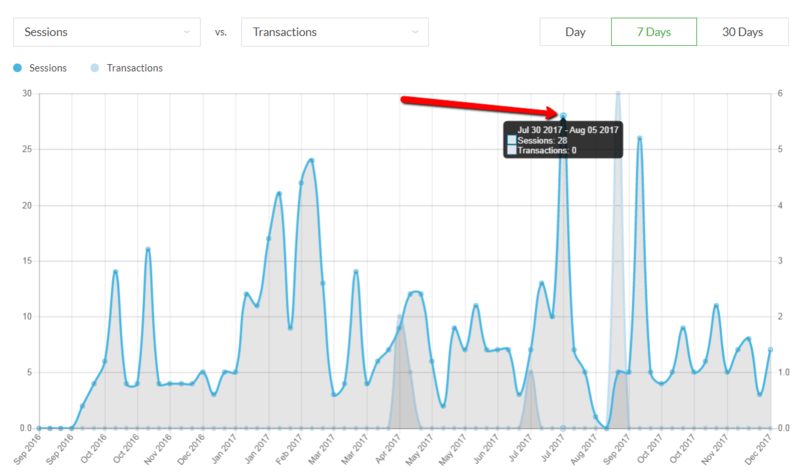 Hover your mouse/trackpad over a point on the graph that you’re interested in to get the exact value of the metrics in this point. 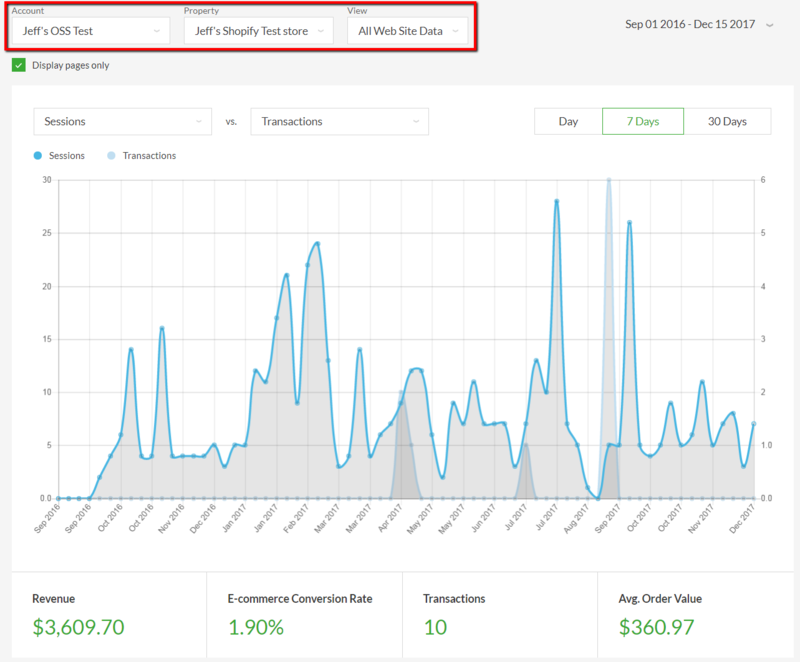 Below the graph you’ll find total statistics for the selected time period by these parameters: Total Revenue, E-commerce Conversion Rate, Transactions and Avg. Order Value. There’s also the ability to compare results for two different time intervals. 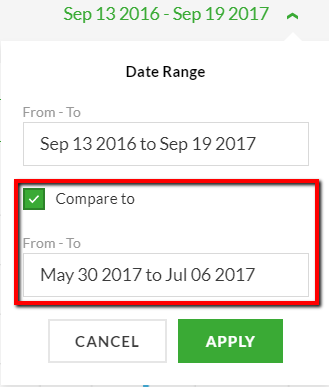 In order to do this you need to select the “Compare to” checkbox in the date picker popup window and then specify the date range for comparison to the original. This will build graphs for both selected time periods in the same area, so they can be visually compared. The detailed stats table will also change to display stats for both selected periods at once + the difference between them (in percents). The table below that contains detailed statistics for each page. Click any column's header to sort the table by that statistic in ascending/descending order. As you scroll down the page, the Page Statistics Header will stick to the top so you can see the relevant information. There is also an option to choose a "Secondary Dimension" to see more information about your pages. Available options include: Page Title, Source, Medium and Source/Medium. If the "Compare to" option is chosen, then it will also display stats for both selected periods at once + the difference between them (in percents) for each individual page. Due to some specific functions of web browsers, you may notice some "side effects" when logging into your GA account. If you logged into a Google account in the same browser where you’re trying to connect your GA account to Zipify Pages (by going into Settings -> Integrations), then it will automatically use that active Google account to connect to Zipify Pages. If you need to connect a different Google account instead, then you need to log out of the Google account opened in the same browser and then connect the desired Google account by clicking on the “Login” button within the “Google Analytics” subsection of the Settings -> Integrations section of the ZP app. Since Google logins work by browser session and there can only be one active Google login per browser session across all tabs, the way to handle this situation would be to use a different browser for the second store to connect your other Google account there or to use a different Property or View under the same Google account for the other store.